Black Holes, New Theories and Revelations? Alien life, likely or unlikely? Recently more work has been put into the researching of black holes, where scientists have looked into how black holes work. Some recently believe that black holes have a different way of working now. Two research papers have recently been published, explain the circumstances and implications of falling/sucked into a black hole. Now we have covered that black holes behave differently, relative to the person standing is different positions in and around the black hole. Where one person looking from the outside and sees another falling in, time will seem to slow down infinitely and will literally freeze and stop moving completely, but to the other person (falling into the hole) time flows normally. This is due to Einstein's theory of general relativity. This event happens on a certain part of the black hole, called the stretched horizon (If I didn’t mention before), this is a hot part of the black hole, which results the falling person, getting hotter or in other words, thermalising and then eventually disappearing, releasing back to the observer as a type of radiation called Hawkins radiation(More on this later). This new theory, is focused on the traveller not the observer, everyone has established that what happens to the observer is correct, at least to our current understanding of physics. The theory re write or at least tries to re write about how an event horizon effects the traveller. This theory has determined that the event horizon is now a type of firewall, where time and space ending instantly for the traveller. These new papers, are trying to implement Quantum mechanics in the theory to make the conclusion work. To explain why and how this works, we need to establish that this theory only works for black holes that are old, the idea of an old black hole is where the hole has actually released or emitted more than half of the particle information that it actually had when the black hole had been formed (Ideally from a Neutron Star). This though is controversial, some say its to do with page time or fast scrambling time. So it might not be EXACTLY correct. This means it could be as old as the universe or even 1/10th of a second old. As you can see there is a massive room for error here and will eventually be establish in the future. Hopefully. What is meant about how Quantum Mechanics is used for the theory is because of this information/radiation that is emitted and which is used to gauge how the process works. Imagine particles of radiation being released and sent into the cosmos, then following it is another few particles behind it, ideally in the event or the edge of the stretched horizon, they might be light years apart but that is irrelevant, really. These particles or radiation are actually connected to one another, as in they know about each other in time and space. This is what's called “Quantum Entanglement”. This is where two particles in the universe no matter how far away they are. Somewhat connected across the vastness of space. (This is also a form of Quantum Super positioning), I might cover this in a future topic, to explain what it is. Now the crux of the matter is where the event horizon, knowing it is between the stretch horizon. Believed that the event horizon was nothing special other than knowing it is the point of no return. 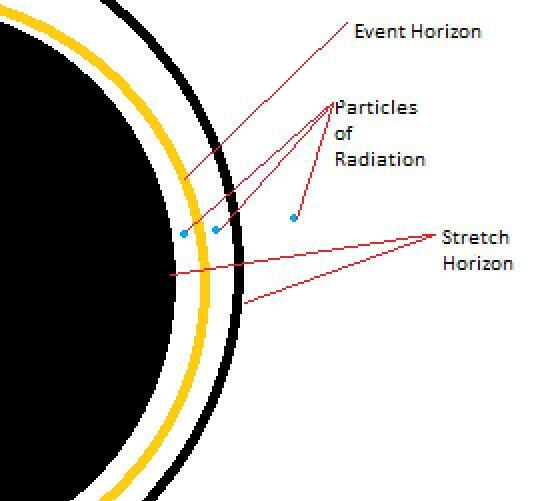 Imagine a particle after the stretched horizon but before the event horizon and a particle on the other side of the event horizon and between the stretch horizon, Seen below. As you can see that, the two particles that are between the Event Horizon. They are supposedly not connected to each other, due to Quantum Entanglement (QE), meaning that the event horizon is actually blocking the connection between both particles, meaning they are not entangled. AS in, the particle that is travelling deep into the cosmos, is not attached to the particle that is inside the event horizon. They are completely independent systems. So the conclusion is that the event horizon is actually acting as a “firewall”, like the firewall on a computer or router. That blocks virus and mal-ware attacks. Essentially a wall that blocks the particles and ultimately one the traveller reaches this event horizon, the person or thing will disappear instantly. This is what's called burn up or others call it termination, to convey the ultimate finality to anything that enters it. Though we have made significant progress in further our understanding, I would say we are just starting to chisel of the top of the iceberg.